Julia’s marriage, too, is a balancing act, as she tries to rekindle her relationship with her husband, Assistant District Attorney David Tanner while maintaining professional boundaries. David is about to bring Nick Rossi to trial for crimes that include drug trafficking, illegal gambling, and bribery. But the story becomes much more urgent when a courthouse bomb claims several victims—including the prosecution’s key witness—and leaves David critically injured. 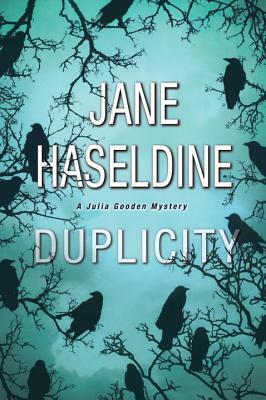 I was so excited when Jane Haseldine contacted me to review her 2nd book in the Julia Gooden series. I had absolutely loved The Last Time She Saw Him and hoped that Duplicity would be just as good. Well, I wasn’t disappointed. The book starts off a few months after The Last Time She Saw Him ended. Julia and David are working very hard on repairing their marriage. David had flaked out during the last book and moved out when things got really tough for Julia. Plus, which was even more unforgivable, he had an affair with a fellow lawyer. Julia, on the other hand, is working on getting her trust back in David, which is understandable and is going to therapy to help get over the guilt she carried over her brother Ben’s disappearance when she was 7. So each of them has a lot to overcome. Julia is working on a story about Nick Rossi, who is on trial for a number of charges and is being tried by her husband, David. Which, to me and her editor, seems like a conflict of interest but she claims it isn’t. The same day that she is going to be in court, following the trail, her son, Logan is going on a field trip to the courthouse. She promises Logan that she will be there for the field trip. While reading a newspaper, she finds out that the identity of the key witness was leaked to press. Which means that Rossi knows who he is and there is a legit concern that he will try to take him out. She tries to call David to warn her, but he isn’t answering his phone. So she heads towards the courthouse…..when the bomb goes off. The bomb kills 13 people and injures many more, including David and the Judge presiding over the case. Luckily Logan’s bus got caught up in traffic and never made it to the courthouse. I loved the whodunit about the bomb because the author genuinely kept it under wraps and threw out red herrings left and right. Just when I thought I knew who set it, bam, it goes in a different direction. So when it was revealed who was the bomber at the end of the book, I was very surprised. Probably as surprised as Julia. I will say that David did have my sympathy during after he got hurt during the bombing. But what came to light afterward, well let’s just say that I wouldn’t have been as nice as Julia. I probably would have beaten him in the hospital bed. Just saying. The end of the book, well starting with when Navarro and Julia were in California and going on from there, was awesome. Full of action and surprises, I was kept in suspense until the very end. Why: A very well written 2nd book. It is rare for a 2nd book in a series that doesn’t live up to the first one. But this one does. Definitely kept me glued to the book.